There is a science behind the Law of Attraction. It isn't just some strange law with no factual basis. The Law of Attraction isn't a missing secret, pseudo-science or smoke-and-mirror trick designed to take advantage of people. Science proves that the Law of Attraction is real. You can find the basis for the science behind the Law of Attraction in quantum physics, neuroscience and biology. Sometimes studying the science behind the Law of Attraction is like studying science…in a strange language you've never seen before. You can't make heads or tails out of wave theory, parallel realities, or the role you play in the behavior of electrons. So how are you supposed to understand what it has to do with the Law of Attraction and how you can manifest your desires? I've been collecting goodies for you. Looking through books and the Internet for jewels and pots of gold. Clear, simple + life changing. Those have been my criteria for the true gems explaining the science behind the Law of Attraction. Here's what I've gathered for you. As always, take your time. There's no need to rush through them. Grab a cup of tea and immerse yourself. Or you can speed through them, absorbing the information as fast as you can. It's up to you. It's all good either way. Just make your choice consciously. This is an important book on how your thoughts create your reality. It really delves into how your genes and DNA don't control you – along with the science to prove it. I love its explanation of how outside influences, such as your thoughts, affect your cells. Have you ever had trouble understanding oneness, heart energy, or anything related to quantum physics? Then you'll love Science and the Akashic Field. 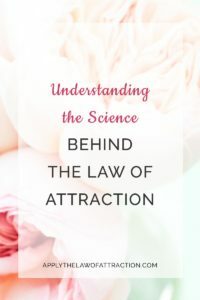 It's a wonderful study of the science behind the Law of Attraction…breaking it all down into simple, easy-to-understand terms.